ImTOO ISO Maker is a smart ISO creator software to make ISO image files from DVD/CD disc for permanent backup on your hard disk. You can convert both data CD/DVD and video DVD to ISO image file. And any CD/DVD discs of almost all formats are supported to make ISO files. 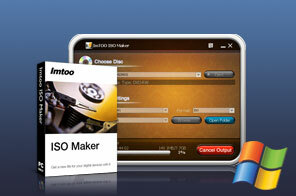 Start to backup CD/DVD by making ISO file with ImTOO ISO Maker now. This easy-to-us ISO creator helps you convert CD/DVD to ISO image file for backup on your computer and other storage medium. No matter the source is a data CD/DVD disc or video Home DVD disc, ImTOO ISO Maker can make ISO image file from it. And any CD/DVD discs of multiform formats are supported. High stability and high speed to make ISO file in a few clicks! Creating ISO file from CD/DVD for backup on your computer is pretty simple with ImTOO ISO Maker. Make ISO file from both data CD/DVD disc and video DVD disc in a breeze. Turn CD/DVD into ISO image file with just one click. Convert CD/DVD to ISO image, copy and backup CD/DVD to ISO file onto computer or other storage medium with high speed. Set one of after-done actions: exit, shutdown, hibernate or standby and let ImTOO ISO Maker automatically do the rest. Record the conversion info and create a log for you to check if necessary. Automatically check for updates to keep it in the latest status. Tutorial : How to make ISO image files?